This is one of 2 new blogs for uni. The other one is here Susi B Art. i have chosen the ‘art’ theme, because art is becoming a big pART of my life! WordPress is new to me, and i am learning as i go! This will be an on-the-job learning experience with a contemplative and hopefully artistic twist….that’s if i can work out how it all goes and get past this, my first post. 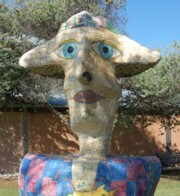 I just mastered to upload a photo of one of our local Sculptures and it was relatively easy! Why ‘the Farmer’ you may ask? It is just the first photo that came up when i was testing how to upload a photo and looking at it now, it is probably appropriate for how i was feeling; somewhat bedazzled, somewhat overwhelmed and somewhat confused about whether i will really handle all this work. Of course, i’m not one that gives up easily, so i am going to give it my best shot, but it is a challenge to say the least! Studying and creating an online identity, especially as now i have decided (yes, finally) to use this blog as my studio showcase, comfort pad, and my springboard for testing out and showcasing my work and my interests in art as part of the brief for Uni. If this is your first visit here, maybe you have stumbled across my Blog for some unusual or unknown reason and as you are still reading this, I welcome you to my world and i do hope you enjoy my space. You are welcome to explore, and if you like to share or leave me a comment so that I know you have been that would be great!